Joyce Arlene Humberd, 57, of Bethlehem, PA, peacefully went home to be with her Savior on Friday, November 9th 2012, after an extended battle with breast cancer. Who could possibly ask for a more wonderful wife, mother, grandma and friend! Born on February 10th, 1955 in York, PA to parents James and Emaline Knepper, the family moved around during her early years as her father served on a construction crew for the Fellowship of Grace Brethren Churches before settling down in York, PA.
After graduating from Northeastern High School and from the Lancaster General Hospital School of Nursing, Joyce married her high school sweetheart Larry Humberd on July 24, 1976. 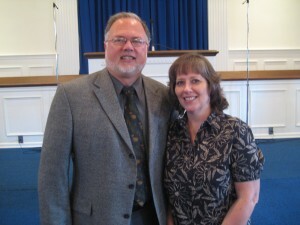 They relocated to Winona Lake, IN while Larry completed seminary training, then moved to Hagerstown, MD where Larry served on staff at a Grace Brethren Church. God blessed them with three daughters and one son and the family relocated to Bethlehem, PA in 1991 where they have served faithfully for 21 years as pastor and wife to a caring congregation at Lehigh Valley Grace Brethren Church. In addition to ministry involvement, Joyce worked as a nurse for the Bethlehem School District. Joyce was highly respected and well loved by countless people with whom she crossed paths, and her love for God and living out the truths of His Word was clearly evident to all. She will be greatly missed. Survivors: In addition to her husband, Joyce is survived by her children, Heidi, wife of Tim Hodge and their children Noah (7), Luke (5) and Abigail (2) of New Holland, Luke, husband of Kim (Bjerga) of Bethlehem, Beckie of Bethlehem, and Julie, wife of Jason White of Emmaus. Because of eternal life through Jesus Christ to those who put their trust in Him, Joyce is now reunited with her parents Jim & Emaline, and brothers Doug and Johnny. Services: A Celebration and Memorial service will be held at 3:30 pm on Saturday November 17, at Lehigh Valley Grace Brethren Church, 580 Bridle Path Rd, Bethlehem, PA 18017. A memory tribute may be placed at www.longfuneralhome.com. Contributions: In lieu of flowers, memorial contributions can be made to orphan care that Joyce cared deeply for: “Project Hope and Charité” c/o LVGBC at above address or online at www.ph-c.com. Larry - Roger and I are praying for you and the family. We are so glad we caught up with each other at conference the other year. May you sense the peace that only God can give at this time. Joyce was a wonderful lady and my life has been impacted by her in many ways.